The memories from traveling are like none other. Good or bad, the experiences of visiting destinations new and old have a profound impact that never leaves you. 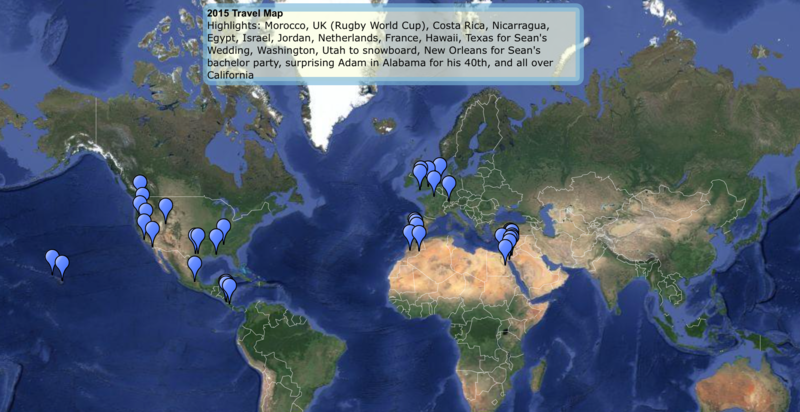 About 8 years ago, I was thinking of a great way to track each year and since I travel so much, I figured, why not document my time on a map. Its a fun exercise that keeps the events and memories of a year going just a bit longer. Maybe your map is super local, but dense- or maybe you sprinted around the globe fast enough to see points on a map that you don’t even remember. Ive done both, sprinting across the sinai or speeding from the upper Himalaya to the Andes to the Amazon…and Ive also taken my time really soaking in one city long enough to become a regular, but just being able to look at my experiences on a map has really enriched the original experience. Sometimes I will just go back and look at some of the dots I failed to really get to know. In the case of my 2010 travel map, Chile was a dot on a map I barely remembered (save that 8.8 earthquake). I flew through so fast that I completely missed the experience…Of course, I ended up living there for 2 years only 18 months later and thus my 2012 map was uber-regional and each dot was deeply embossed in my mind and heart. Sometimes, I realize Ive done so much more without even leaving the country..or state. 2017 was all about the Eastern Sierras of California…an otherworldly area a short drive from my home. In 2016, my maps began to tell a story. They became a deeper reminder of where I was during pivotal world and life events. Sometimes, I will go back, look at my map and once I see a dot, I remember everything that was happening in the world when I was there- I remember faces, smells, tastes, and I have a deeper appreciation for the experiences. ..and travel isn’t always about bouncing around with a backpack aimlessly looking for novelty or following the tourist buzz in search of boxes to check. For me, its an office. I spent the last 4+ years running a large technology organization often from the other side of the planet. There is a dot on my map in Dahab, Egypt where I had to stand on my tippy toes on a table to get phone reception for a board meeting. I was the only person in the hotel as the majority of tourists were too afraid to be in the Sinai with ISIS running around blowing up checkpoints. There are dots in Taipei and Stockholm where I closed major deals from a world away…and I’ll never forget those places or those events. I have dots in Santiago and Kochi, India, 2 of the places I was when my college team won the title. They are all linked together, I will never forget where I was April 3, 2017. I was coming home from a weekend trip to Santa Barbara with my fiancé. My dogs pulled me on my skateboard down the coast close to where I went to college and it felt like I was a kid again. I got back to San Francisco and my father passed away that night. You never know exactly whats going to happen in your life, but I think making an annual map is a worthy endeavor whether its of your adventures in your hometown or on a much grander scale. Either way it really ties everything together. ..So my advice would be; Make a map so you’ll never forget. How do I make a travel Map? Making a map to document your adventures is a lot of fun and isn’t too difficult…and its much easier then trying to make a map where none exists. Some folks that I know love maps so much they even build entire companies and communities around them. Create a Google Map: This is the best way to go regardless of your medium because you want to ensure you don’t lose your map. Start Dropping pins: Get as detailed as possible, maybe you hit up a bunch of small towns on the outskirts of Paris…treat them with the same pin-dropping respect as a metropolis. Add the important details between: Maybe you reconnected with an old friend in a new town or came upon a unique event. Maybe you found out life news while somewhere. You can add dates and even pictures to your map to really connect the memories with the place. Archive: Make sure you put your map in a file that won’t go missing so you can periodically visit or share. I save mine in google’s cloud and also save a snapshot of the map.